Richard Tinkler is an artist. Team (gallery, inc.) will present a show by New York-based painter Richard Tinkler from 24 January through 02 March 2019. Entitled The Door to the Cosmos, the Echo of Memory which Projects into the Future, and the Tally of the Soul, this grouping of new paintings marks the fourth entry in our project room series “Gallery B.” The gallery is located at 83 Grand Street in New York, cross streets Wooster and Greene, on the ground floor. Each of Richard Tinkler’s paintings adds to a steadily expanding network that accumulates and complicates collective meaning, a systematic practice that stimulates chaotic growth — intimate and expansive fever dreams. For many years, Tinkler’s painting practice was one of reduction and repetition. The seriality remains, however, over the past year, his practice has amplified to become one that incorporates initial inspiration, material complications, gestation and reflection, blurring, layering, erasure and other forms of problem solving. Employing frames, apertures, and lattices, the paintings are architectural in their use of structure and organization to configure an internal experience. Emanating from or converging on a central point, they resemble psychedelic quilts that flicker between opacity and translucency, ripple from liquid to solid. Working wet on wet in oils, each brushstroke acquires the material and optical qualities of the prior or adjacent layer. Such a technique displaces color as the primary descriptor; Tinkler’s luminous and tangible surfaces are instrumentations of light, temperature, and atmosphere, renderings of paint as metaphysical and physical substance. The artist’s practice establishes an overarching system linking the works, iterations on a theme that generate a complex chain of cause and effect, a feedback loop that distorts straightforward causal reasoning and which necessitates an analysis of the body of work as a whole. In “Knock on the Door To the Cosmos”, Tinkler begins with a quotation of Richter’s Abstraktes Bild works, though the final layer of scraped-away white paint is revealed as a panoply of careful brushwork pastiching Richter’s technique. A blue rectangle inscribed with a pattern of lines appears to sit on or dissolve into the surface; suspended between opaque aperture, translucent object, or slowly drying paint, it is metaphor and mimesis, phenomena and the thing itself. Tinkler’s drawings and earlier paintings approach pure structure, existential meta-diagrams built through intricate matrices reminiscent of the ribs and vaults of a gothic cathedral. 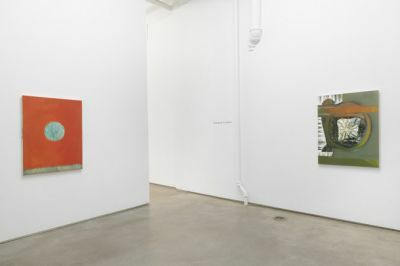 The recent paintings on view, however, frustrate such satisfying elucidation as their compositions team with movement and chaos, offering a radical departure from the clarity of the earlier work. Meditation, we might note, can be a process of catharsis above all else, a means of gaining perspective on the scalding ferocity of our human messiness. Tinkler’s new pictures remain mystical to their very core. Tinkler has been showing his work with increasing frequency over the past four years. Exhibitions include those at Galerie Thaddaeus Ropac (Salzburg and Paris), Anton Kern, CFHILL, the Maramotti Collection, Kerry Schuss, Albert Merola, LaMontagne Gallery and Cheim & Read. Mr. Tinkler is represented by 56 Henry.